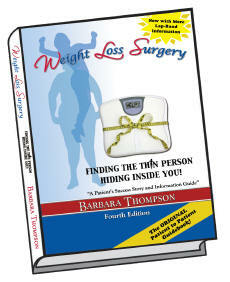 A 225 page book that answers all your questions about Weight Loss Surgery from the patient's perspective. Written in a warm and easy-reading style that makes you think that Barbara is in a conversation with you sitting across the kitchen table . Recommended by thousands of patients and surgeons from all across the country. The first and still the Best!!! This is the first book that puts all weight loss surgery research in one place. Written by an RNY weight loss surgery patient, this 235 page book covers all aspects of the surgery from a patient's point of view. It answers all the questions that people have when they are considering this life changing procedure. It also gives detailed guidance about life after the surgery and how to ensure your success in finding the thin person hiding inside you. The world renowned surgeon, Dr. Philip Schauer has written the foreword to this book.